Prasun Choudhury's 'How Did It Go' is the coming of age story of five engineering students of I.I.T. 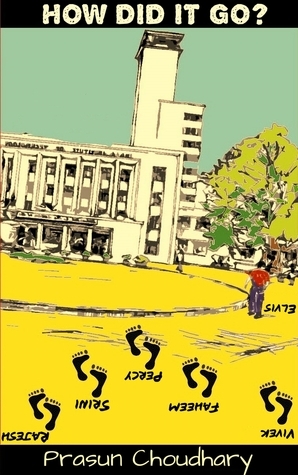 Kharagpur.It is the typical desi campus story by a techie- turned- author trying (a bit too hard) to be an inspirational/self-help version of Chetan Bhagat's 'Five Point Someone'. Written in the form of the protagonist Percy's journal,'How Did It Go?' traces his four years of life as an undergraduate in one of the most prestigious Institutions of the Country(read 'Indian Institute of Technology').It's about how he meets and makes new friends,falls in love and ultimately learns some big 'life lessons' from his failures. As the author rightly tells us in the beginning of this work,'HDIG' is no nobel worthy literature.It's a simple story of five friends narrated without any literary pretensions which infact turns out to be it's biggest strength as well.I'm sure that this book will remind atleast some of you of your long forgotten College days-the good old days in which you were a free bird and did whatever you felt like doing.The illustrations by Biban Roy are quite good and helps in setting the overall tone of the book.The writer has included a few practical takeaways from the small mistakes which he had made during his formative years which also works to the advantage of this book. But sadly,all good ideas don't necessarily translate into fast entertaining reads. The basic problem with this book lies in it's execution.The writing is too verbose and fails to evoke any kind of emotion in the reader.Even though the writer has put in a lot of effort to pack in a number of amusing incidents in the book,all the efforts go down the drain,thanks to the mediocre writing.To make matters worse,the editing is also shoddy and as a result the narrative goes on without any definite direction for a major portion of the book.Agreed,the book is a collection of incidents in the college life of Percy and his friends,but there should be some sort of connection between the events so that the reader doesn't lose interest in the proceedings.Perhaps, this book would have worked better if it were an anthology of Campus stories! The characters are poorly developed and appear half-baked.Honestly,the protagonist,Percy never comes across as a likeable or a funny person.At times the book itself reads like a memoir rather than a genuine work of fiction.Btw,I just found out that there is a website called couponzdeal which is giving out discount coupons for buying books online.Check it out for yourself and redeem coupons. Verdict:Overall,'How did it Go?' works in parts.I'm giving it a two out of five.